Life: So, I had another semi-embarrassing moment yesterday in court. A judge asked me in a condescending tone "Are you a lawyer??" - NO I'm just standing here in a suit, at the podium, calling the client's name because I'm a random person off the street?? I just don't even understand who he thought I could be? Whatever haha! Clothes: We have reached the end of my first ever 30x30! I've got 2 outfits to close up the month. First up is a more casual work outfit. I almost paired the blue sweater with my cobalt blouse, but in the end went with pink instead to try to bring some spring into this winter 30x30. Although I had my tweed jacket with me at the office, it was just WAY too hot to even put it on for pictures. I also got a bit more creative than usual and used my black suit dress as a skirt. I used a thicker belt to cover up the fact that my shirt isn't actually tucked into anything, but is instead just rolled up. I'm sure a ton of people already know this trick, but I learned how to do it from Elle and Jean. All I did was gather my shirt in the back, and cover any lumps and bumps with the belt. The only problem was that this somehow made my dress shorter than usual. This is about as short as I'd go for a work outfit. I'm excited to be done with the challenge, but I certainly had fun doing it. I'm going to post a recap tomorrow along with a reflection about what I learned. Haha, wow. "Are you a lawyer?". "Omg, no! This isn't the DMV? I just need to get my drivers permit. I turned 15 today you know!" I have a friend who's a lawyer, and she's not petite but she's very pretty and she encounters a lot of flack for it in the world of law as well. Bummer! You don't have to be old and ugly to be smart! Haha. And I like the trick with the top and the dress! Very smart. I might have to try that out soon! I love the pink and blue combo with the blouse and sweater in the first photo. So pretty! 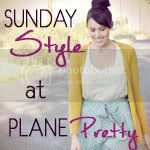 Cute outfits and blog! I just had to transfer all my files too, never fun! I think I may have to try the 30x30 challenge. What a great way to be creative with what's in the closet. I love your outfit. That cornflower blue sweater is just so lovely. Looking good!